Prajna Counselling Centre is an Indian charitable non-profit organisation mainly working on social development and education. The organisation, located in Mangalore, Karnataka, came into being in 1987. Prajna’s aim is to help and guide individuals and families in need of emotional, psychological or economic support. Prajna’s mission is reflected in its symbolic name: ‘Prajna’ means ‘awakened consciousness’ or ‘enlightened awareness’ and symbolises the equality of all human beings. The organisation helps marginalised people irrespective of their caste, religion or gender. Prajna is especially committed to the empowerment of women and girls. The founder and director of the organisation, Hilda Rayappan, suffered herself from being discriminated against. She is now an important role model for many women and helps people in need to regain hope and find enjoyment in life. Prajna has many years of experience with working with and for women. The idea to organise a radio programme about women’s rights was developed by female members of the honorary board. Since Prajna did not have the financial means to implement the programme, Dhira provided the necessary funds. 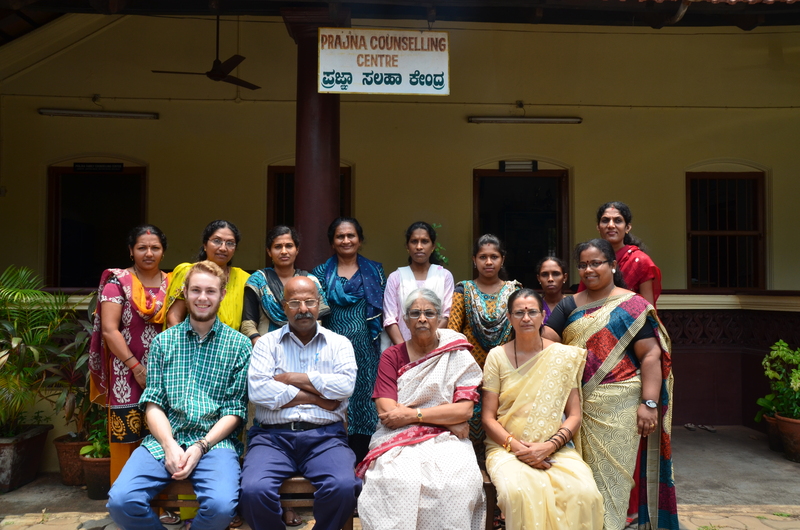 Sitting (left to right)Mr. Jonathan – BBP Volunteer, Assisting in Radio Programme, Mr. Devdas – Coordinating Dheera Project, Prof. Hilda Rayappan – Director of Prajna Counselling Centre, Ms. Thilka – Accountant of Prajna Counselling Centre. Standing (left to right) Ms Geetha – Counsellor of Women’s Help Line, Ms. Shalini – Social Worker of Women’s Help Line –, Ms. Vidya – Assisting for Dheera Project, Ms. Devika – Coordinating the Radio Programme, Ms. Reshma – Counsellor – Family Counselling Centre, Ms. Jyothi – Counsellor of Short Stay Home, Ms. Yashoda – Superintendent of Short Stay Home, Ms. Dhanalaxmi – Coordinating the Radio Programme, Ms. Chithra – Counsellor of Family Counselling Centre.